• Height Range 39"-51" Load Bearing Capacity 25,000 lbs. 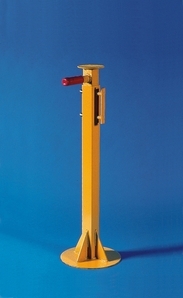 Top 7" Base 12"
• Load Capacity based on actual vertical loading. Load test reports available upon request. Be careful when comparing capacity claims between different brands of trailer jacks. The true measure of strength in a jack is its tested load bearing capacity. • NOTE: Use wood blocking to fill up daylight between top of jack and underside of trailer.